I was thinking a lot about my blog the last couple of weeks. Looking back I can truly say that it was successful and definitely the way I wanted it to turn out. On the other hand I was quite busy the last months teaching myself to sew to improve my skills and to be able to make my own clothes. All I can say is that I’ve learned a lot so far and I’m continuing to teach myself and to try new things out. The only problem of it all is that sewing and pattern-making takes a lot of time. Since fashion has been my love for many years now I’ve made the decision to indulge into it very deep this year and to devote my free time completely to cloth-making. I don’t want to give up my blog, but use it to share with all of you who are interested my steps and progress in making clothes. I’m still not sure about the name and the design of my blog. Maybe i will not change it completely. I’m still very thankful to all of you who decided to follow my blog and I hope that most of you will continue enjoy and to follow my journey. As for now, I’m presenting you my last recipe so far. A ginger loaf with rose petals and white chocolate. Grease and line a 900 g loaf tin with non-stick baking paper. Preheat the oven to 160 ° C. Sift together the flour, baking powder, bicarbonate of soda and ground ginger. Set aside. 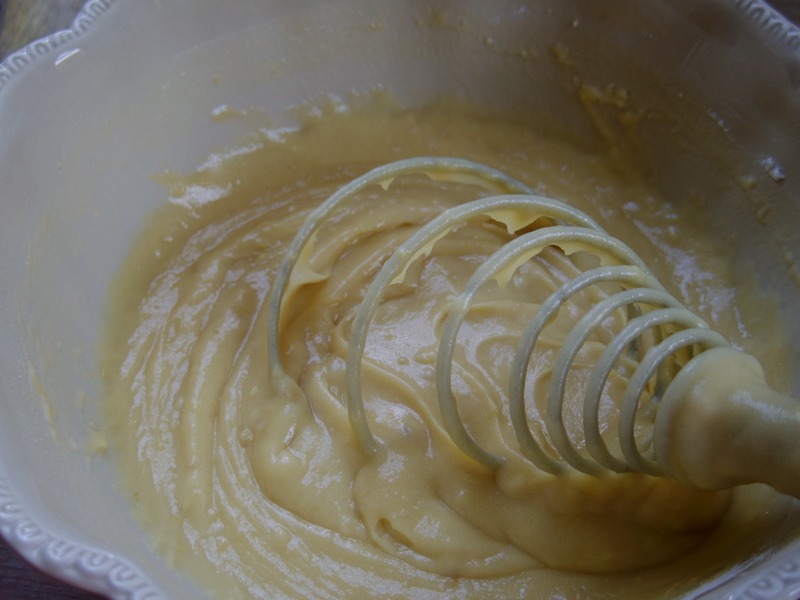 Chop the globes of the ginger and add to the flour mixture. 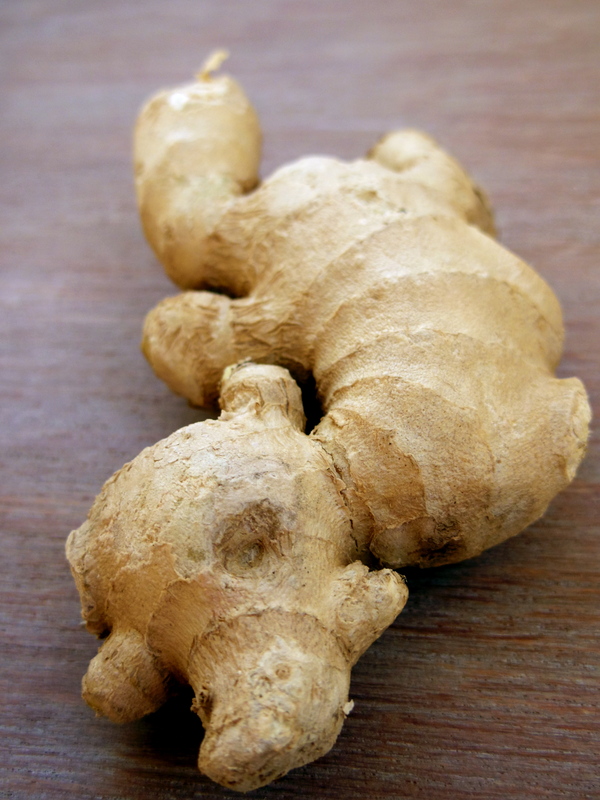 I’ve used some preserved ginger in honey. 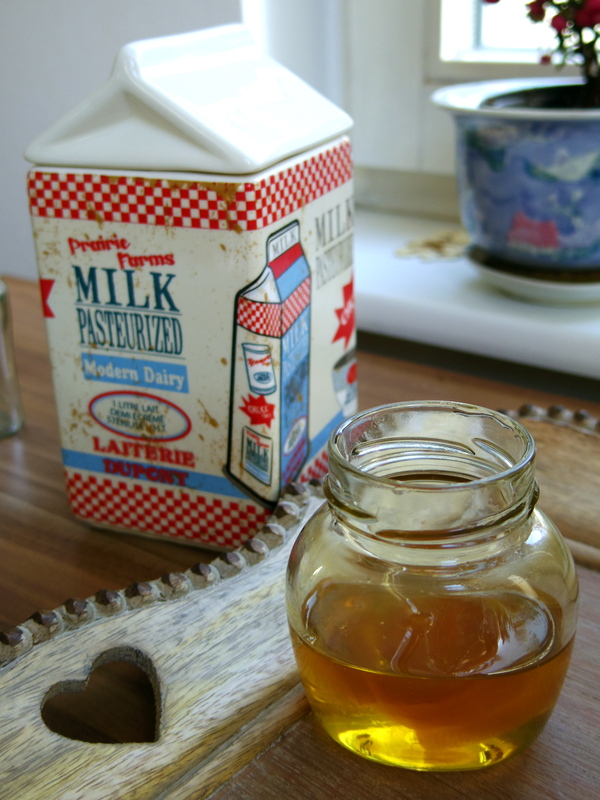 Melt the butter sugar and golden syrup/honey in a small pan. Set aside to cool slightly. Beat the egg and milk together. Stir the cold syrup/honey into the dry ingredients, followed by the egg and milk and beat well. If you like you can use some of the rose petals and add into the mixture. It will give the loaf an interesting taste. Spoon into the tin, bake for about 1 1/4 hours until just firm to the touch. 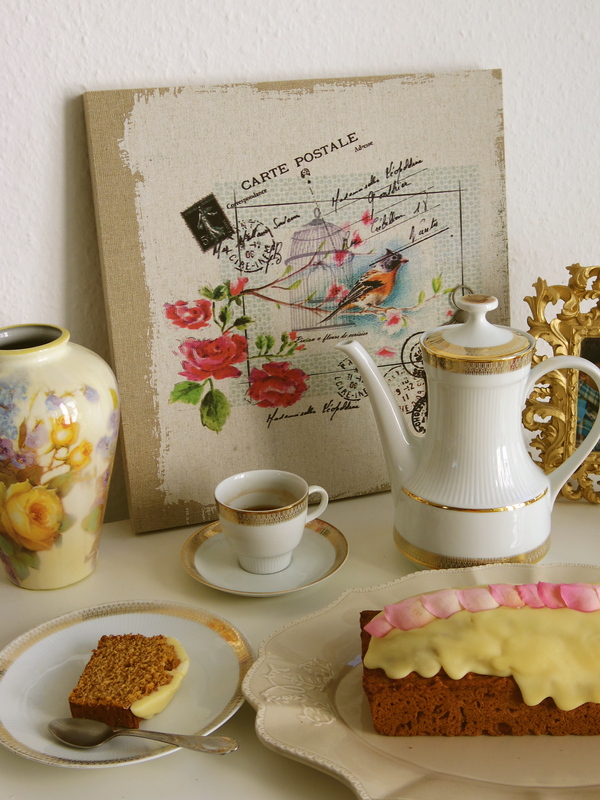 Cool on a wire rack and decorate with a white chocolate couverture and the rose petals the way you like it. Enjoy and have a great weekend! This week was weird! Although I’m having one week of holidays I’m still not feeling relaxed. Every single day is running by so fast. I really don’t know how to stick to my tight schedule for this week. At least the weather is more sunny than rainy this week so that I could capture one hour of sun today. I think I need to remind everyone who reads this blog that I’m far from being a professional cook. I’m an amateur learning how to cook and trying to improve myself day by day. Of course, that doesn’t mean I’m such a horrible cook. 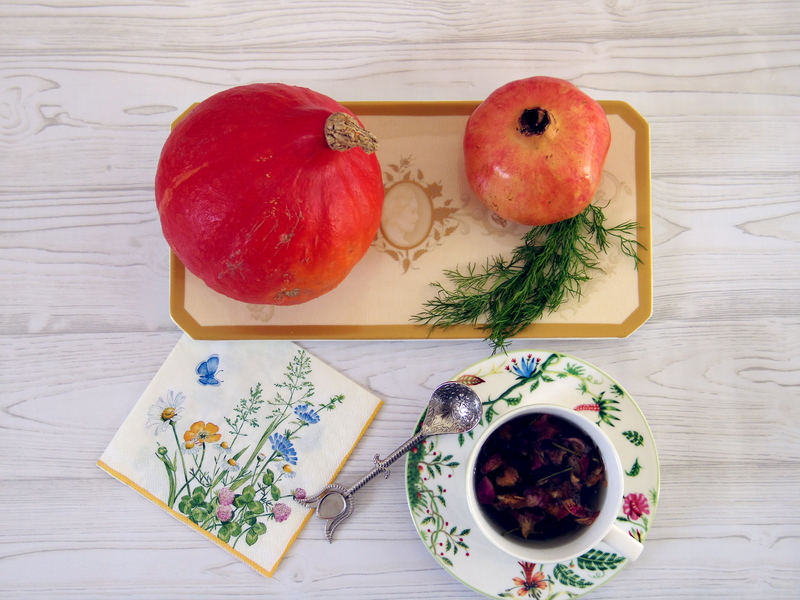 To prove you that I’m able to deliver some decent recipes I’m presenting you today another creative dish made with two adorable fruits: Hokkaido squash and pomegranate! I was thinking a long time if there’s actually an english name for the japanese hokkaido squash. The hokkaido orange squash that I’m using for my recipe is quite common here in Germany, but I haven’t really seen them in the US yet. 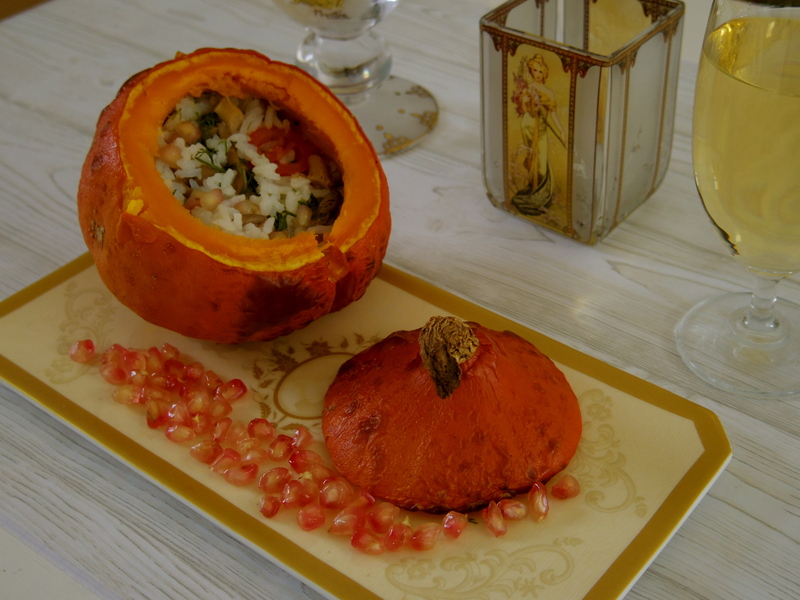 Whatever, it is definitely a lot of fun to prepare stuffed hokkaido squash with rice and pomegranate! 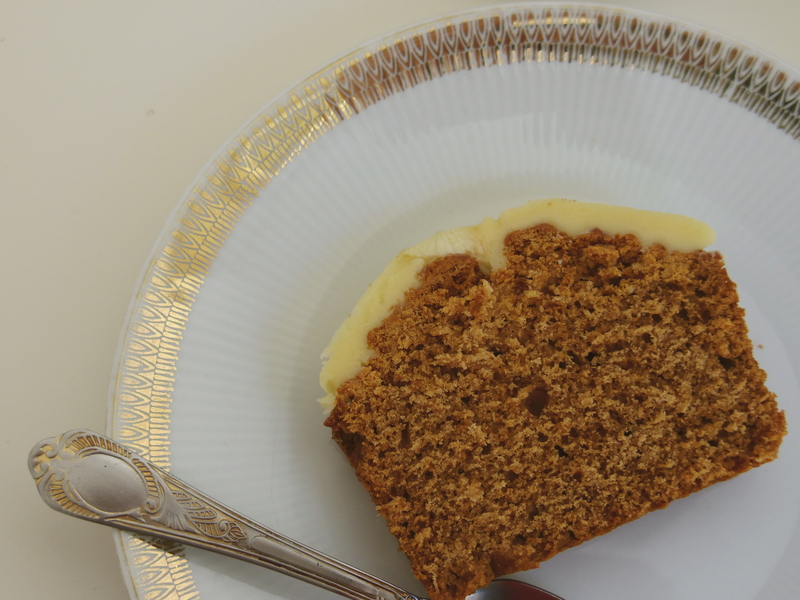 What is more, it is the perfect dish when you’re planning to invite guests and to surprise them! 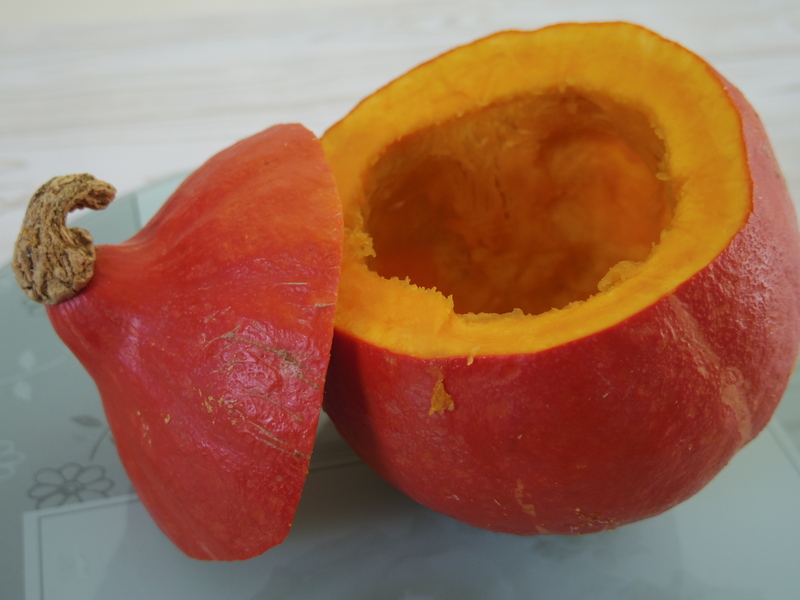 Cut off the top part of the squash as seen in the picture above. Use a sharp knife, hold it at an angle to the chopping board and carefully cut round the top of the squash, cutting out a shallow cone. 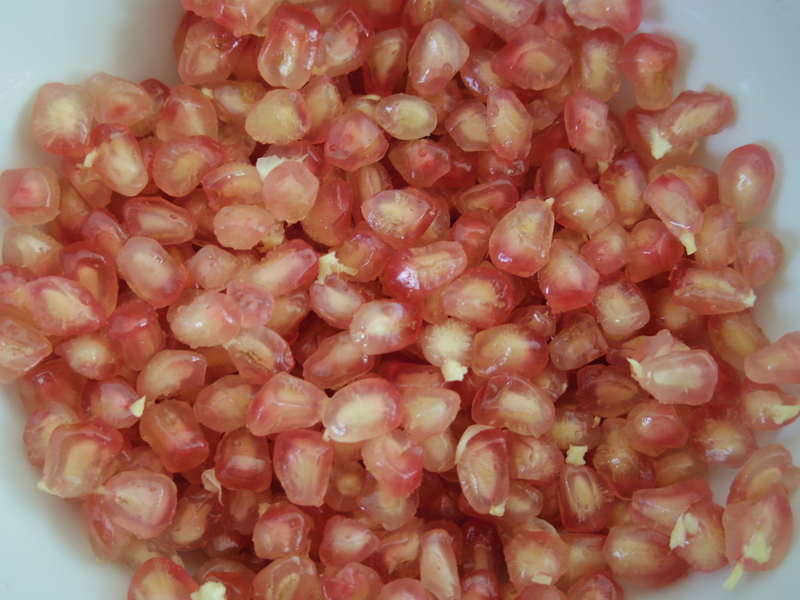 Use a teaspoon to scoop out and discard the seeds and the stringy fibers. Boil the rice in a small saucepan until it is tender. 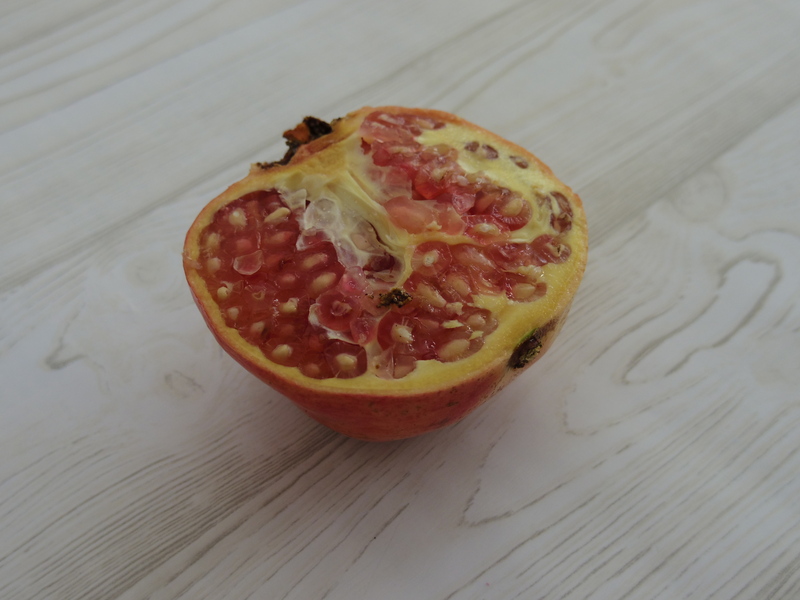 In the meantime, half the pomegranate along its equator and, holding the cut side over a bowl, beat the seeds out of it by bashing the skin with the end of a rolling pin or a wooden spoon. Of course, you can also scoop them out with your fingers. Chop the mushrooms and the tomatoes, put them in a saucepan and sauté them for 3 – 5 minutes. 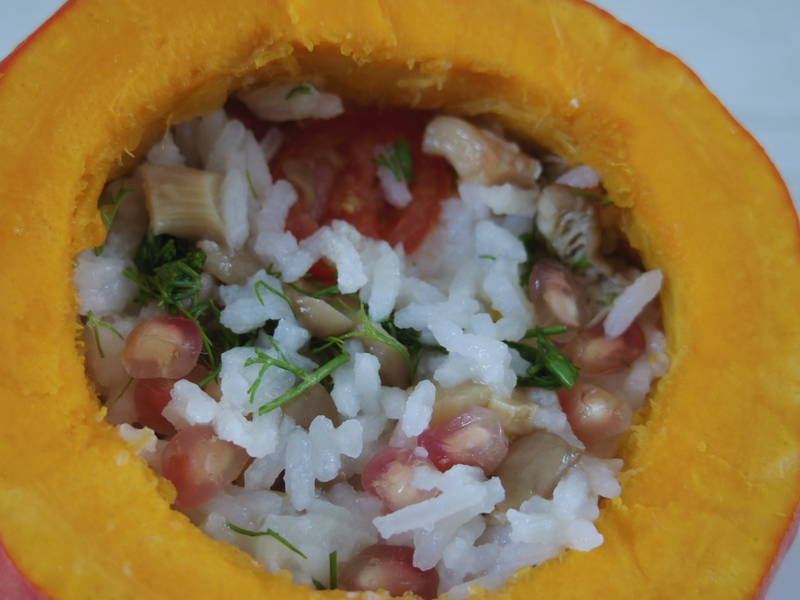 Take a bowl, put the boiled rice with the mushrooms, the tomatoes and the pomegranate seeds in it. Chop some fresh dill or other fresh herbs and add them to the other ingredients in the bowl. 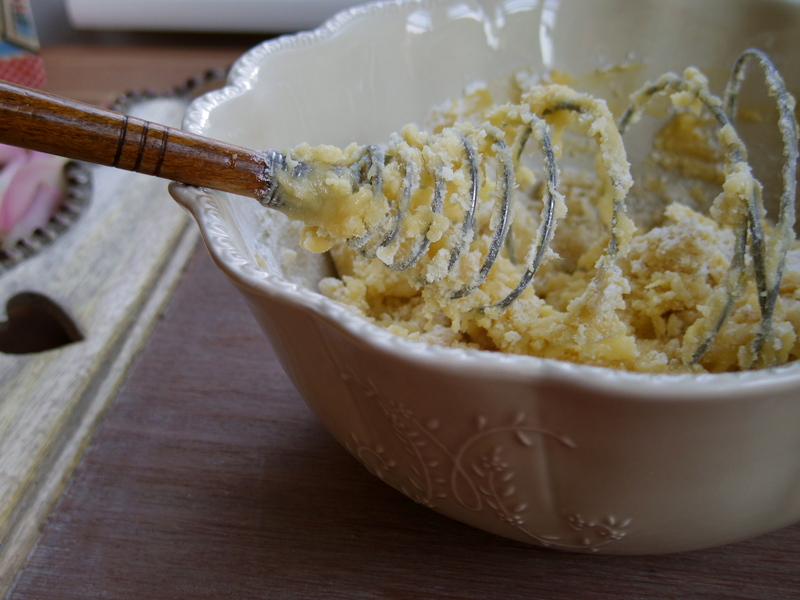 Now knead everything with your hands or with a big spoon until it is incorporated. 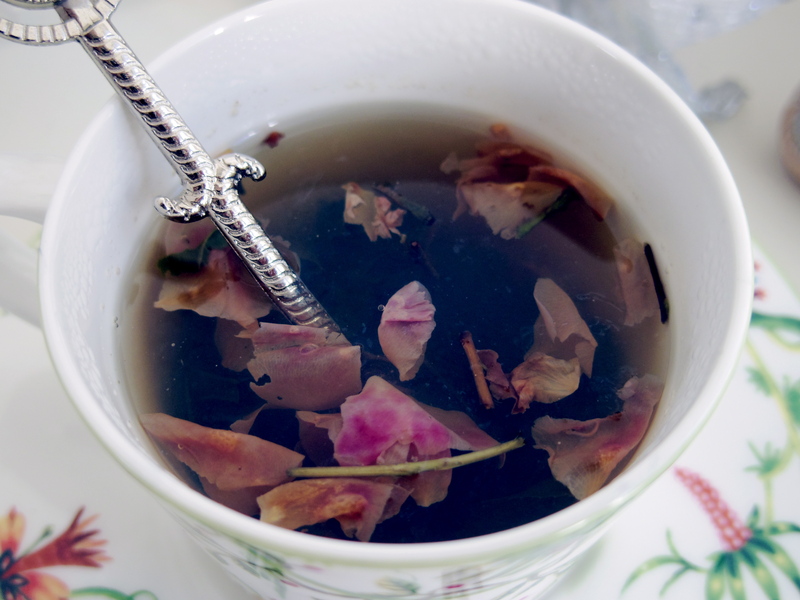 I also brewed up some rose tea to add a few rose leaves into the rice. You can leave it out or simply put some rose leaves on top of the squash for decoration. 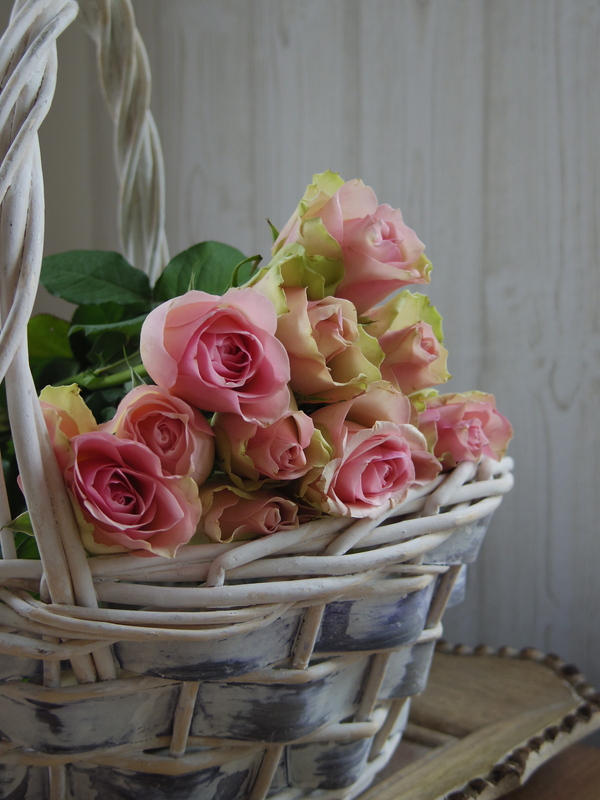 I love to use eatable flowers, especially roses, for my dishes. Of course you can use fresh rose leaves too! Preheat the oven to 180℃. Spoon the rice with all ingredients into the quash. Put the cut top back on the squash and bake for 30 minutes until the squash flesh starts to get tender. You can test it with skewer. The best way is to serve it hot out of the oven! Enjoy your stuffed squash, the next squash recipe is on its way!